A California gang member with a number of unusual face tattoos is back behind bars after a routine traffic stop ultimately ended in his arrest on drug and firearm possession charges. Khamprasong Thammavong, 33, a documented Laos Blood gang member, was pulled over around 5:40 p.m. on Monday in southeast Fresno for a routine traffic stop, according to the Fresno Police Department. When the officer ran Thammavong’s information, he discovered that the gang member was out on probation and called for backup. Because the man was on AB109 probation — meaning he had served time in prison for a non-violent crime — his home was open to search and seizure, the police department said. When officers searched Thammavong’s home, they found “numerous” signs of his gang affiliation, including photographs of the man posing with various firearms. A further search of the house turned up a semi-automatic rifle and a semi-automatic handgun, the same guns that appeared to featured in the photos, which were not registered in Thammavong’s name. Police also found tactical gear similar to police-issue equipment. The search also turned up a 38-plant illegal marijuana grow and various drug paraphernalia. Thammavong was booked into the Fresno County Jail on several felony charges, including being a felon in possession of a firearm, and cultivation of marijuana. 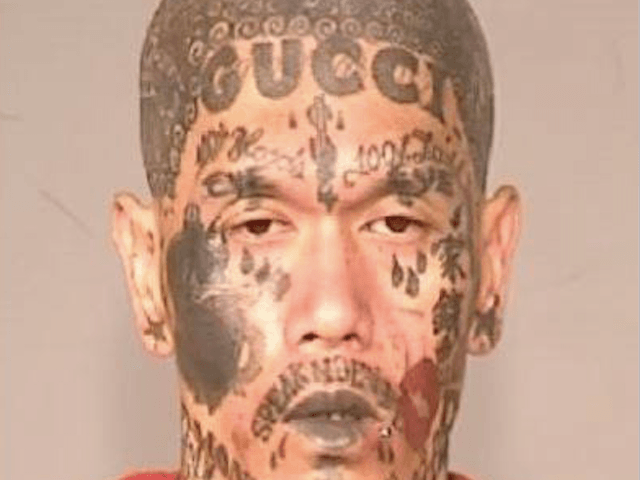 The Fresno Police Department released a mugshot of Thammavong, who sports several facial tattoos, including the word “Gucci” inked across his forehead.